"We have gained a great response from the people by applying 'Omni-Directional lens technology' with its own patent to various fields such as intelligent parking control solution and intersection monitoring solution". QDIS Co., Ltd. (CEO James Kim) has launched VR department in August 2016 and launches security solutions to enter the video industry based on virtual reality. Especially, we are actively developing optical system centering system. We are taking a lead in the field of omnidirectional lens technology. The omnidirectional lens is designed to reflect all the light inside the lens and form a direct image on the image sensor. As a result, there is no edge image distortion, image quality is uniform, no blind spot is present, and high resolution is a big advantage. QDIS is demonstrating a range of solutions that utilize omnidirectional lens technology. 'Intelligent parking control system' is used in parking lots such as large mart, convention. The conventional parking control system using one - way camera did not perform the security function by checking only the vehicle on the parking side in order to identify the vehicle number. However, the QDIS Intelligent Parking Control System can monitor not only the car number, but also the whole area without blind spots, so there is no need to install additional security cameras. A single camera identifies six license plates at the same time and provides the availability of parking and my car search service in real time. The 'fence cam surveillance system' which enables wide panoramic video surveillance utilizing the wide viewing angle characteristics of the QDIS omnidirectional camera lens. It can be installed on a fence, perimeter, etc., and can monitor inside and outside with a single camera around the perimeter. It can be installed in a place where there are boundaries such as schools, public facilities, and wire rods, and it can monitor the inside and outside of the boundary with panoramic images, and can use security functions such as fire detection and border penetration. In addition, the "cross-over omnidirectional surveillance system" attracts attention. This system is installed at a road intersection, and it can monitor the traffic conditions of four directions of intersection with one camera and interfere with the illegal car violation by linking with the PTZ camera. It is being installed and tested at a local autonomous intersection, and it is evaluated as having excellent performance. We have been managing the company for a long time, but there have been a lot of twists and turns, but we have been able to lead the company transparently and fairly without giving up easily and giving good results. James Kim said, "The most memorable thing in running the company is that we received the Minister of Model Taxpayer Prize as the best taxpayer in 2012." We are recognized that the company is clean and transparent, I was very proud of my contribution to the country. " CCTV companies as well as domestic manufacturers are struggling with competitors such as China and the current situation. In the form of a business that lowers manufacturing costs and labor costs, Mr. Kim emphasized that there is no further development and the survival of companies is difficult. "For the development of the industry, we must compete in the world market with solutions that stand out not only for the product itself but also for ideas and specialized technologies that use product features and quality," he said. And we will be able to successfully export our systems to the world market. " 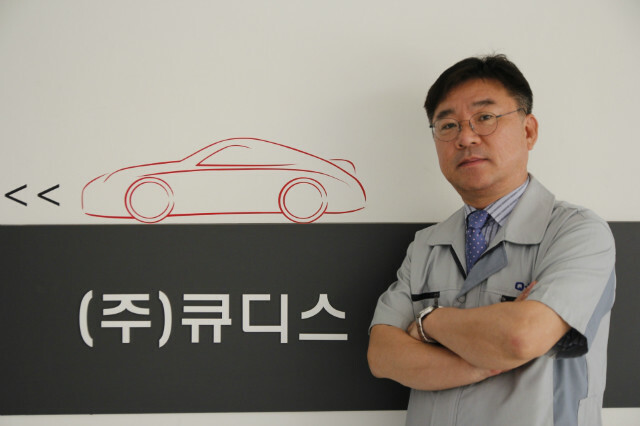 Let's have a sense of ownership and a developer mind, and Mr. Kim emphasizes to his employees. If you do your best with your attitude that you play an important role in your company, you will always try new things with your mind to study, if you encounter difficulties, you will solve problems by solving and solving problems. I think the company will be able to develop and raise personal competence. "We are continuing to develop and expand solutions that utilize the characteristics of QDIS lenses, such as nuclear reactor nuclear reactor wall monitoring, image shooting and park surveillance solutions, using our specialized lens technology," said Kim. "We are actively promoting lens technology We will actively pursue market development by collaborating with companies that need lenses. "